UPDATE: On Monday, Monsanto chipped in another $540,000 to fight I-522, bringing the No campaign's total funding to nearly $22 million. First, it smashed the record for fundraising by a campaign opposing a statewide ballot measure. Now, No on 522 holds the title for most money raised by any initiative campaign in Washington state history, period. Bankrolled by out-of-state biochemical corporations and food industry heavyweights, the campaign trying to defeat GMO labeling Initiative 522 on Saturday broke the $21 million mark in total contributions, the latest campaign reports to Washington’s Public Disclosure Commission (PDC) show. In the process, the No camp surpassed Washington’s previous high mark of money raised by any initiative campaign. The old record — set in 2011 by Costco-backed supporters of the liquor-privatizing Initiative 1183 — was $20.1 million. The No on 522 campaign reached record ground fueled by last week’s contributions of $3.8 million from the food-industry PAC the Grocery Manufacturers Association, and $460,000 from biochemical giant Dupont Pioneer. The Yes on 522 campaign, meanwhile, has raised about a quarter of its opponent's war chest — $6.3 million. Dr. Bronner's Magic Soaps is still the campaign's biggest contributor, having poured $1.7 million into the effort. The Yes camp's latest big-ticket donations pale in comparison to the No side's recent influx of cash. Last week, Aveda founder Horst Rechelbacher, now CEO of organic beauty company Intelligent Nutrients, gave $50,000 to the campaign; health food producer Nutiva donated $35,000; and American Halal Company, maker of Saffron Road frozen foods, contributed $22,500. The No campaign's expensive campaign strategy seems to be paying off. According to the latest Elway poll, support for I-522 is waning: 46 percent of voters surveyed said they support the measure while 42 percent said they oppose it. The difference is now within the margin of error. 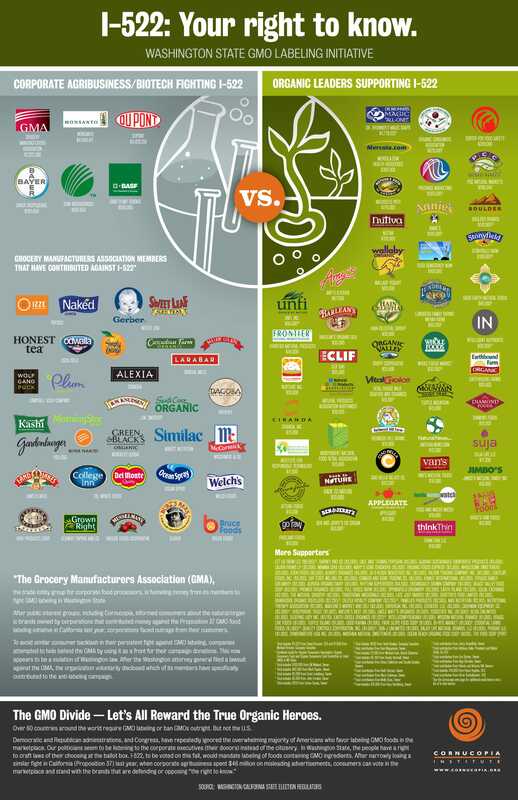 Want to know where your favorite food brand stands on GMO labeling? The Cornucopia Institute has created this infographic showing which popular organic/natural food manufacturers have financially backed or opposed labeling in Washington.